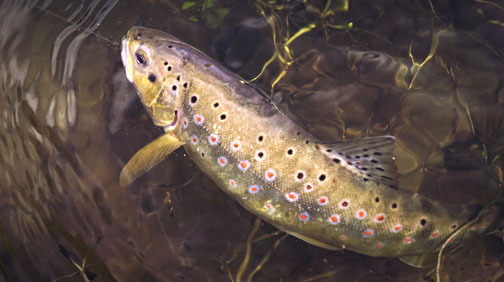 Anglers come from across Ontario and around the world to test their luck for Algonquin Park brook trout and lake trout. The area near Algonquin Bound East Gate is famous for its quality fishing with some of the quieter lakes in the part. Not to be over shadowed are the many hidden gems near the West Gate and Sand Lake Gates. No matter the season, there is always good fishing in Algonquin Provincial Park. Come visit us at any location to find out what's hot and what we recommend to increase your fishing success. The Algonquin Park fishing season opens on the last Saturday in April and ends September 30th. Earlier in the season, until late June, the best action is for the brook and lake trout. These cold water fish prefer cooler water and can be found closer to the surface at this time. The bass season opens in late June and many visitors are surprised to find such good fishing these aggressive sportfish in Algonquin Park. During summer trout can still be caught, but bass and northern pike are the more frequent catches. As fall settles in, the cooler nights help cool the waters and trout become more active. The park has special regulations and anglers need to be aware of the restrictions before heading out. Things like slot size limits and designated voluntary catch and release lakes are having positive effects on the Algonquin Park fishing. Before heading out, be sure to check the Ontario Recreational Fishing Regulations Summary to ensure all specific rules are followed. The following are the many fish found in the park along with recommended lures for each. We also highlight some of the better Algonquin lakes, rivers and streams we service. These ugly looking creatures are one of the stronger fish you can catch in the park. 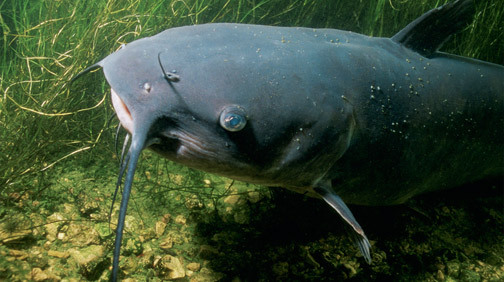 Catfish are mainly found in the Petawawa River watershed in lakes like McManus Lake and Lake Travers. Some huge catfish can be found through this system, with catfish caught over 10 lbs (4.5 kg) in size. They frequent the bottom of the lakes and rivers and can be caught by bouncing a worm and jig head off the bottom. Despite their appearance, they are quite good eating. 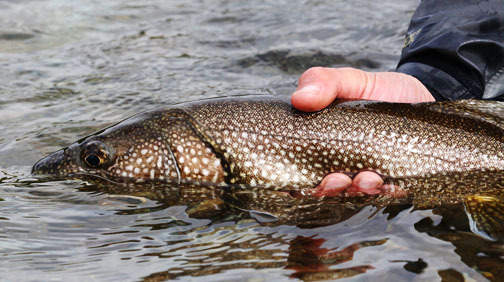 Lake trout are recognized by their forked tail, long head and an abundance of spots. They are one of Algonquin Park's most sought after sportfish and good lake trout destinations include Booth Lake or Big Trout Lake. Lakers are found near the surface in spring and will take spoons and spinners, especially on the troll. As the waters warm, trolling deeper is necessary. Lead core or steel line is a popular method of finding where they are holding. Popular lake trout lures include the Williams Wobbler, Apex and Little Cleo. Another popular catch is largemouth bass. Nicknamed bucketmouths, these fish frequent the quiet back bays of Bark Lake or Rock Lake where plenty of weed growth or shore structure is found. 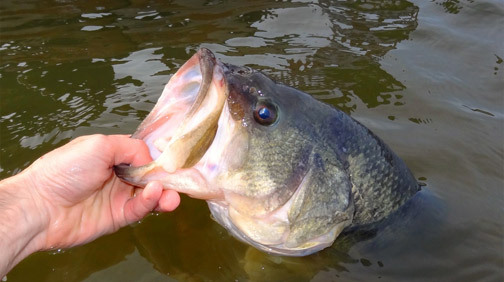 Almost all Highway 60 corridor lakes offer bass opportunities and largemouth are regularly found. They often strike topwater presentations such as the Jitterbug or the Hula popper. Alternatively, weedless Berkley jigs, Mepps spinner baits and Live Target crankbaits are recommended. 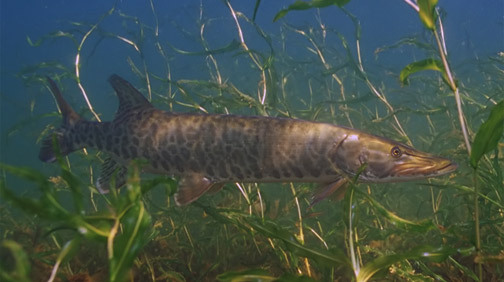 Muskellunge are the largest freshwater sportfish species in Ontario and can reach over 16 kg (35 lbs) in size. Muskie are an aggressive creature with sharp teeth that feed on mainly baitfish. They cruise shoal areas or weed lines where baitfish congregate. Trolling is a popular method, but casting larger crankbaits along weed lines and off underwater structure can also be effective. Northern pike are aggressive fish that readily strike fast moving spoons and spinners. 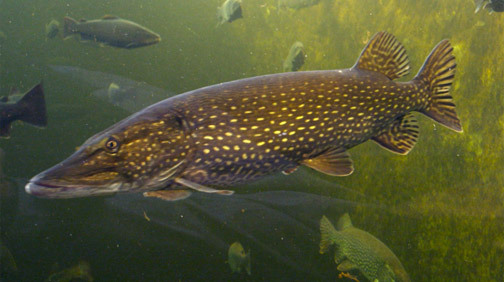 Identified by their long slender bodies with large mouths and sharp teeth, pike can be often found in the calm bays of Algonquin Park lakes such as Booth Lake or Shall Lake. Fishing success is best on calm overcast days casting spoons, spinner baits or crankbaits along weeds or other bottom structure. Popular northern pike lures include the Daredevil and the Five of Diamonds, while silver and gold Williams Wobblers are also good choices. Algonquin Park smallmouth bass have a reputation of putting up a great fight when hooked. They love structure and will gravitate to underwater drop offs and rocky shoals or shorelines such as in Crotch Lake or Grand Lake. 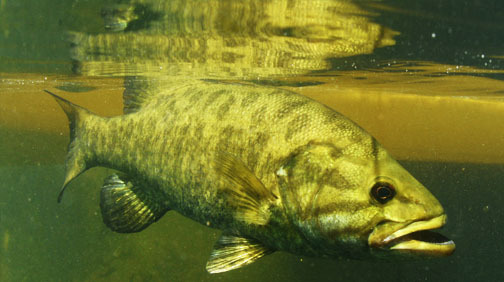 Recognized by their football shape and green bodies, underwater presentations are usually more effective for smallmouth bass. Popular choices used to catch smallmouth are the crayfish fly or lure, Berkley jigs, Mepps or Blue Fox spinners, and Live Target crankbaits. Anglers often fish Algonquin Park in search of the elusive brook trout or speckled trout. McKaskill Lake, Carcajou Lake or the upper Opeongo River is a good choice, especially early in the season from late April into early June. At this time, fishing for brook trout from shore with smaller silver or gold spinners like a Blue Fox or Panther Martin can be effective. Fly-fishing and even bobber fishing with a hook and worm are also popular. Later in the summer, trolling deeper with small spoons such as the Little Cleo is effective. There are a few select walleye or pickerel lakes in the Algonquin area. These include the Opeongo and Madawaska Rivers, as well as the Petawawa River system. 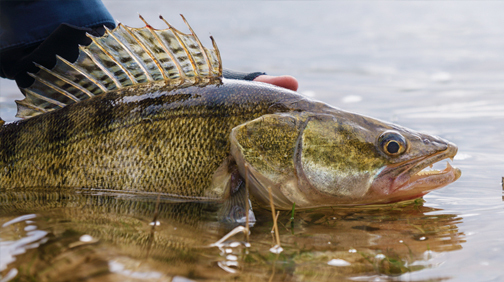 One of the favourite lures or set ups for trolling for walleye is the worm harness. Jigging white or chartreuse Berkley jigs over rock piles, weeds or drop offs can also produce results, while other presentations include Live Target crankbaits and Rapala minnow presentations.